also easy to sew and finish product beautifully. main body of machine but also knife in our factory, and carry out thorough quality control. your frequency of use and any materials, also automatic machines. for user to easy to use. *It needs table and driving motor for using skiving machine. 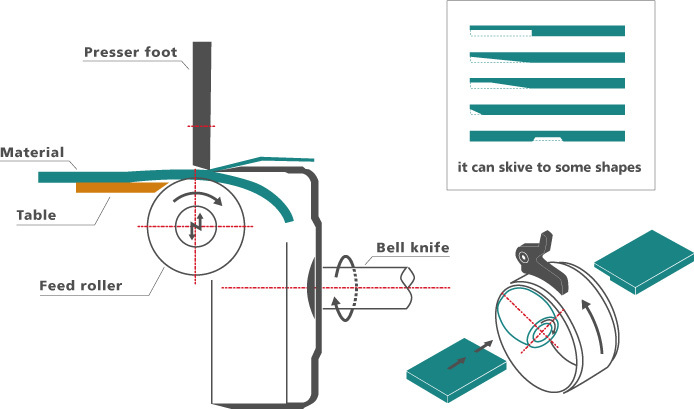 After setting materials, the material engages into the space between feed roll and presser foot, then it is skived by knife edge. Basically, the necessary size of material is put up above and the wastes go down after skiving. The skiving thickness depends on the height of presser foot, and also the machine is equipped with feed roll with spring for dealing with variation in the thickness of leather or rough materials.